Where festivity is in the air, where tribal culture blossoms within every heart and where natures beauty is ready to cast a spell on you Yes we are talking about Bastar and we cannot wait to tell you more about it. The traditional lifestyles, dance, music and the world of local deities is the uniqueness of this place. 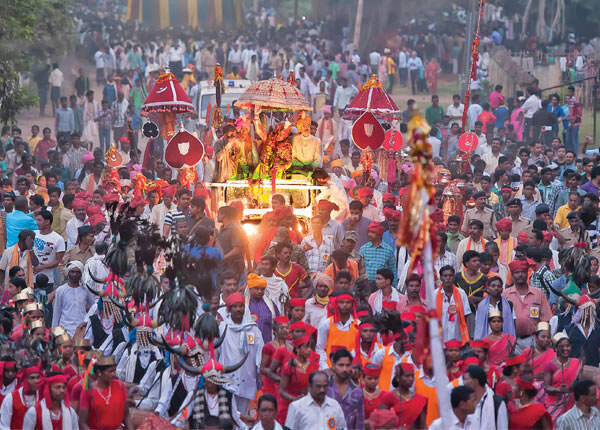 Similarly, the one speciality that Bastar has is the longest festival in the world The Bastar Dussehra. 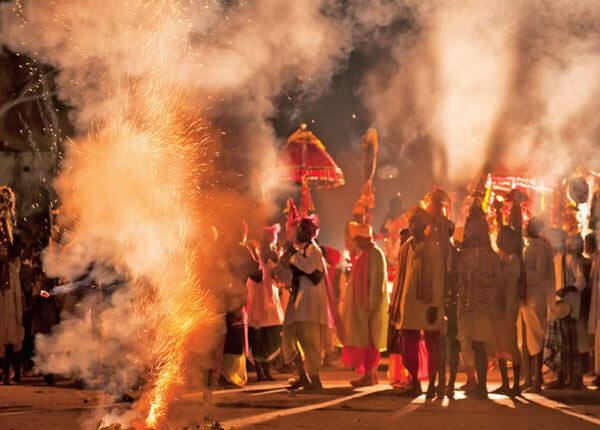 It is one of the most colourful and spectacular festivals you will ever come across anywhere in the world. 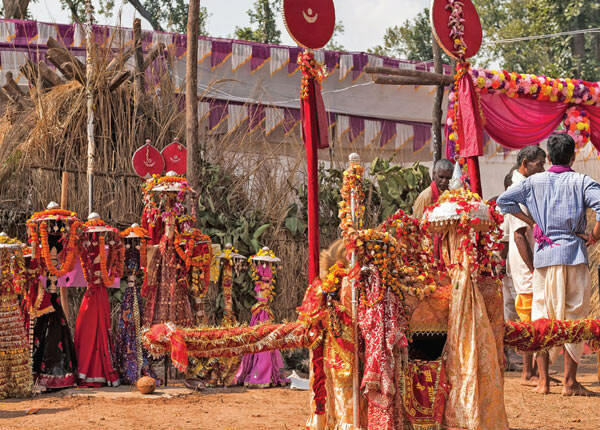 Bastar Dussehra also called Jagdalpur Dussehra takes us back to the time in 13th century in Bade Dongar, where the king of Bastar Purushottam Dev reigned. He was a dedicated follower of Lord Jagannath of Puri and his immense faith made him walk down for a year to Puri to seek blessings of Lord Jagannath. It is said that the priest of the temple gave him the title RathPati (head of the chariot) and the 16 wheeled chariot was made on his command as Lord Jagannath himself ordered him to do so. The king returned the 4 wheels in order to make his journey easy which is now used for Goncha festival which celebrated in the beginning of Bastar Dussehra. 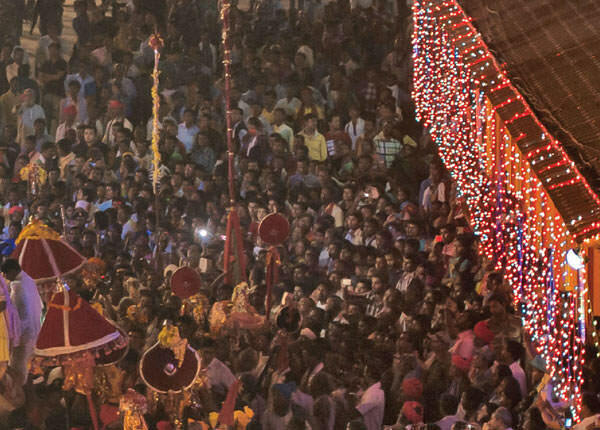 So this festival is not about the Lord Ram and Ravan, it is about the Goddess Danteshwari Devi, where all the people along with the king pays homage to the goddess. It is a 75 days long triumphant celebration which inculcates of various ceremonies all of which are celebrated with great pomp and show. 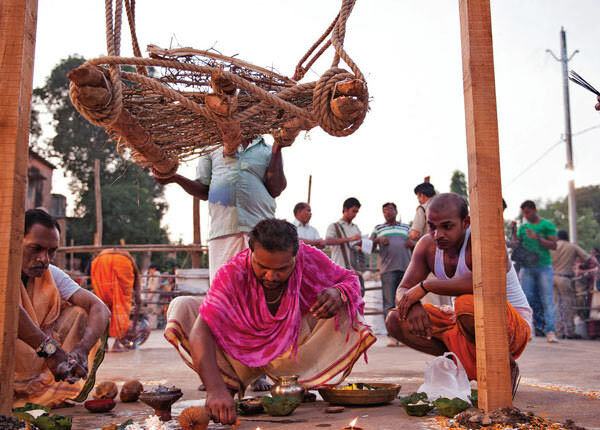 It is the first day of the festival wherein everybody is dedicatedly working for the construction of chariot. 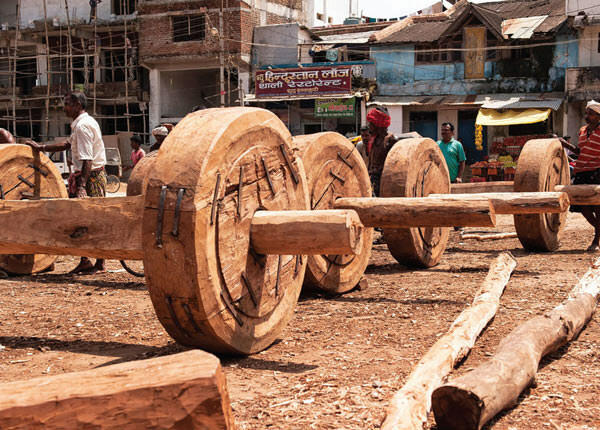 The tribals bring sal tree logs which are used as a tool to make the chariot. The making of turlu khotla, or wooden tool, is to commence the festival. On Shravan Amavasya, it is believed that the wood becomes holy after the rituals. After PaatJatra comes the 2nd phase of the festival. During this, people bring small branches to install a mandap at the SirasarBhavan. According to the tradition along with other objects are also placed other than the branches which includes rice in it. After two weeks of DeriGadhai comes the KachanGadiPooja dedicated to Goddess Kachchin held in Jagdalpur. On this day a virgin girl has to play the role of Kachchin Devi who is made to sit on the swing of thrones. After this the King arrives with his ministers in order to take permission from her to start the festival. This is done in order to remark the acceptance of the Goddess. The fourth phase involves the amalgamation of Bastar Dussehra and Navratri. 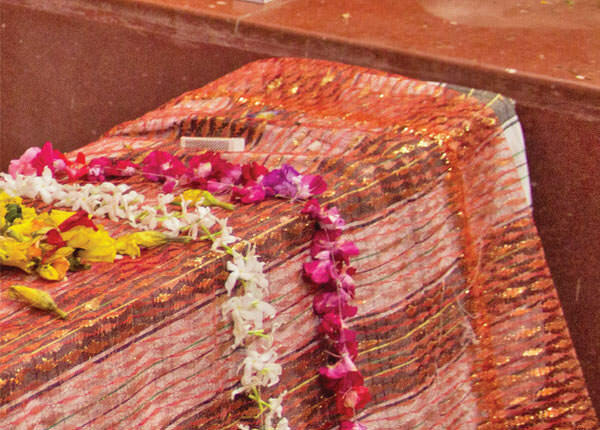 The Kalash Sthapana takes place where barley is carried in the pots to start the worship of the Goddess. This commences the ninth day of the festivity which calls for invocation on to the Goddess Shakti. 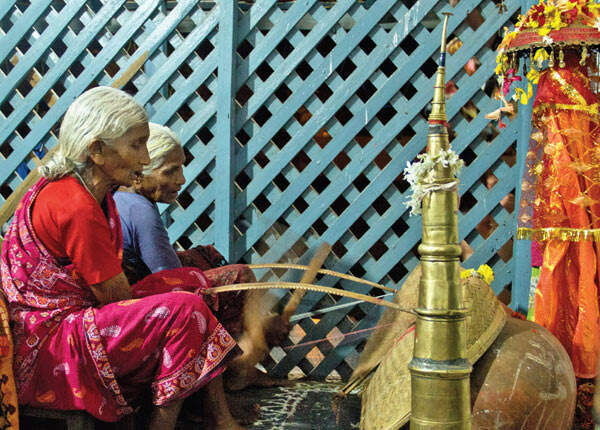 The same evening of Kalash Sthapana is reserved for JogiBithai. 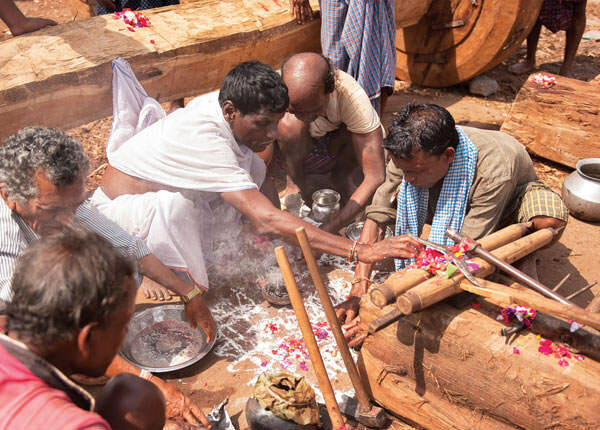 Danteswari Devotee (jogi) of Muria Family is involved in this wherein a young man fasts for 9 days and sits in one position inside a deep pit, to ask the Goddess to bless them and look over the celebrations over the next few days. At evening the Jogi visits the King and to the Sirasar Bhavan to close it. He settles after a Small Pooja. The next set of pooja takes place in all the temples if the vicinity. The tradition includes the prayer offerings to nine different Goddess on nine nights. The tribal’s of the regions moves down to Jagdalpur, and starts up the camps which lighten up the whole environment. At the time of Navratri week, a four wheeled rath is made by a group of trained tribal. 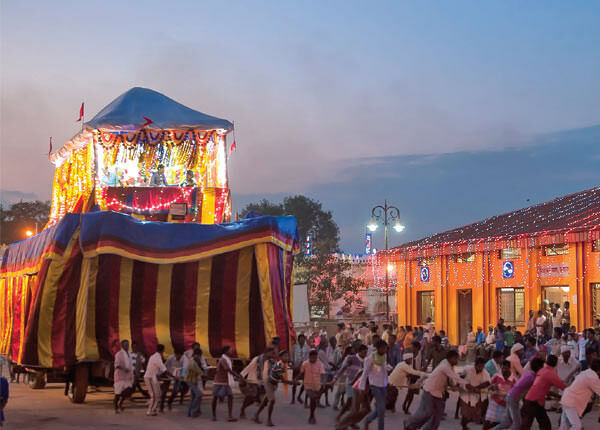 At the evening the chariot is pulled by the tribal by ropes from Sirasar Bhavan around the Gol Bazaar, Tehsildar Chowk and then back to the Danteshwari Temple at the Bastar Palace. In the eighth day the ashtami pooja is done at Danteshwari temple at Bastar Palace and few people have access to attend it. This day the weapons of the Goddess are worshiped by the royal priest and the king. Along with this people worship their instruments a gesture of gratitude. This takes place at the same day of the Ashtami Pooja. This event witnesses the presence of the king and the royal priest. 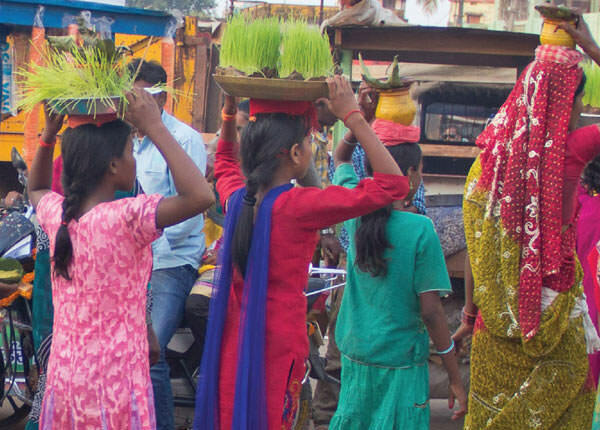 12 men from Yadav community arrive with earthen pots on their heads filled with rice and dal. After this pooja, bhog is served by the Yadav’s to the Goddess. After this the Yadavs smash the earthen pots in corner, symbolically getting rid of all ills that the community and the region face. 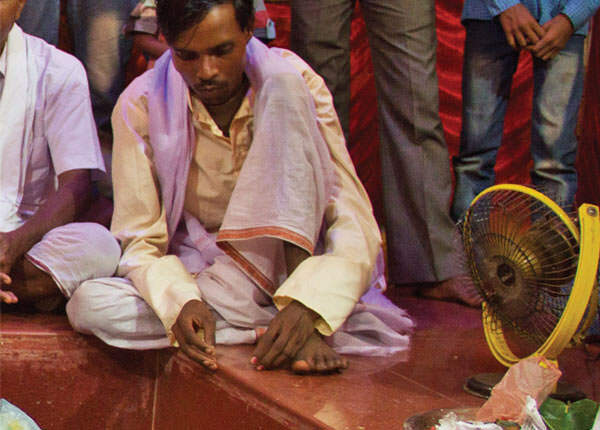 Kunwari Pooja is performed at DanteshwariTemple of Bastar Palace. It is about the Navratri customs under which nine virgin girls are feeded as a sign of showing respect and devotion to the nine Goddesses, which is also known as Kanyapooja. The JogiUthai comes after the nine days of Jogi sitting on a fast at the pit at the Sirasar Bhavan and he eats. At the evening everybody comes to seek blessing from the Jogi who did such a difficult and ambitious task. 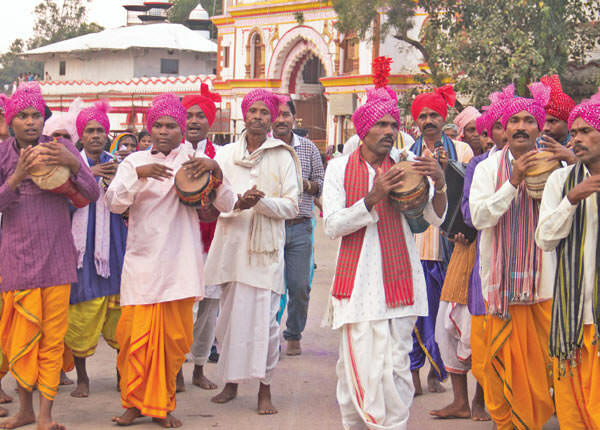 Everybody visits the temple during Dussehra, on the day when the Devi leaves in a Palki for Jagdalpur with Bison Horn Murias leading the procession with a tribal dance. After sometime the idol is transferred to a heavily decorated truck going to Jagdalpur. The truck stops at several places for people to see and greet. This day is when the goddess arrives in Jagdalpur and the people from here all joins the event and gives the goddess a huge welcome. The evening has two processions one is that of the priests from Dantewada with the holy palanquin and the other is the King with his entourage on foot. 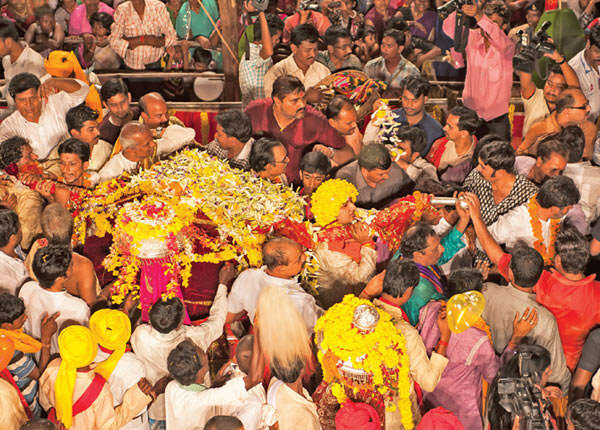 The king comes to take the palanquin on his shoulders to carry the Goddess to the Jagdalpur Danteshwari temple. The next day is when the goddess is allocated to sit in the Rath. On this day the chariot is pulled by the Bison Horn Marias who arrives in swarms from different parts of Bastar. 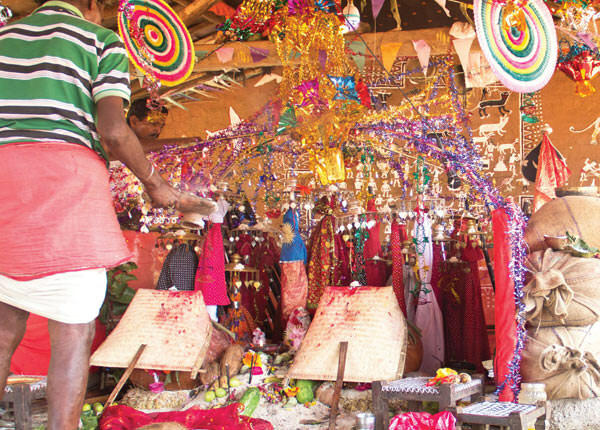 After this the goddess is placed at the top of the Rath. The head priest is also sitting while the chariot is being pulled, while the people cheers and enjoy the spectacular view. On this day, the rath is stolen by the Bison Horn Marias and parked at Kumhda-kot. On the next day, the King arrives here to retrieve the rath and take Goddess Danteshwari back to the temple outside the Bastar Palace. The king of Bastar arrives with his ministers and after a small prayer they eat. Again the chariot is being pulled and people are filled with excitement and joy. From this day the celebrations are about to end and the king bids adieu to the goddess which is a young girl who embodies her spirit. The pooja takes place in the same small shrine as before, where the young girl, dressed in black, enters the shrine with the priest. After the pooja she stands out while a goat is being sacrificed amidst the hymns and local songs. The little girl collapses in the corner of the room, assisted by her family members and devotees alike. 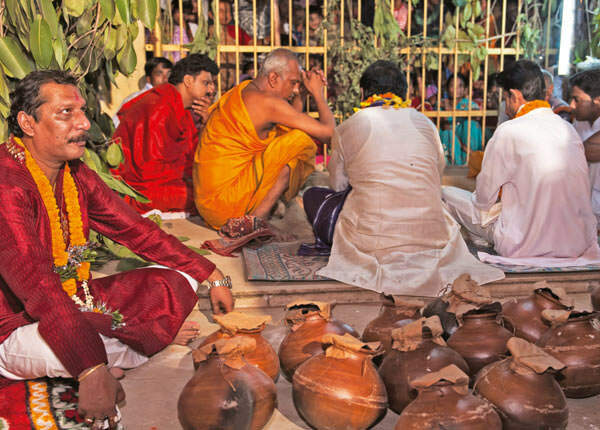 The ceremony is intense and a window into the deep faith that the tribal have towards their local Goddess. This is the tradition where the tribal led by their respective heads, who assemble to meet the King and discuss their issues with him. This meeting is held at the Bastar palace and only the assigned members are allowed to meet the king. This is the second last ceremony of Bastar Dussehra. 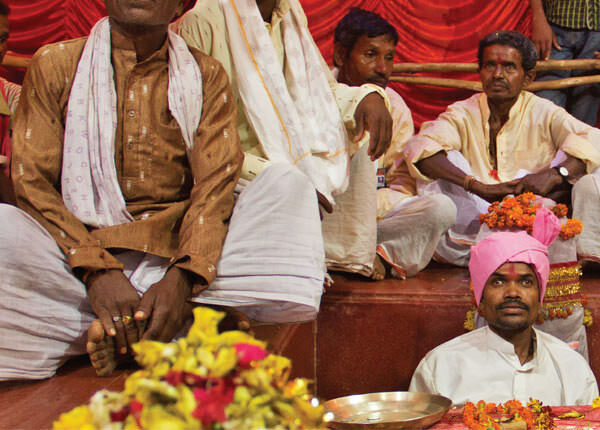 This is a vidai ceremony where a vidaimandap is made in Jagdalpur. 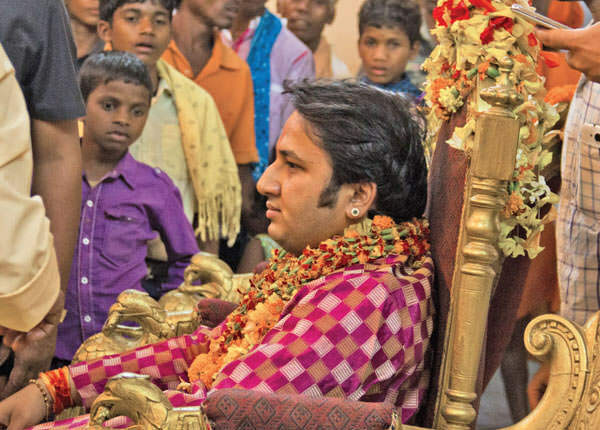 The king sits on a small pedestal and blesses the people. A pooja is done on the presence of the king and people start leaving after that. The final day that is the 75th day of the festival when Maa Danteshwari Devi leaves for Dantewada after the celebration. 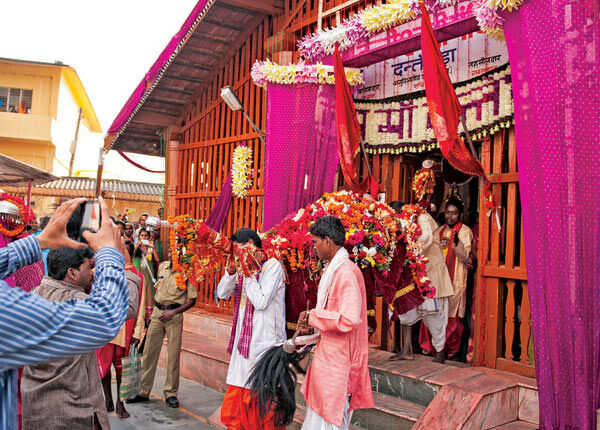 The ceremony of her farewell takes place in the morning at the Bastar Palace Danteshwari temple and the procession with the sandal idol finally leaves the Jiya Dera area at noon. The King along with his ministers and royal priests ends the ceremony. And finally, the deity is propped again in the truck as a sign of culmination of the festival. In a nutshell, Bastar Dussehra has the essence of the devotion, faith and the exuberance for the festival which witnesses heavy participation of people. Every day has a unique energy of its own which is visible on the people’s faces. You can imbibe the feeling if you ever got the chance to witness yourself the world’s "longest festival."